The excavators of Frankhthi cave, near Portokheli in southern Greece, a site that was inhabited for many thousands of years in prehistoric times, found a tiny coriander fruit in a layer dated to the seventh millennium BC. If this was really something that the ancient cave-dwellers might have used--and not a red herring, dropped by one of the excavators--it makes coriander one of the very oldest spices in human use, quite as old as the ginger and sugar cane whose prehistory is traced above. Coriandrum sativum is certainly native to Greece and the eastern Mediterranean. It was familiar in Egypt in 1352 BC, for it is one of the foodstuffs found in Tutankhamen's tomb. As korianna its small dry fruits were listed in the Linear B tablets, in Greece around 1300 BC. Coriander played a major role in ancient Greek and in Roman cuisine, and has never ceased to be popular around the Mediterranean. Its popularity has spread far eastwards and westwards. We have already seen that it was introduced to India, probably at the time when the old Persian Empire stretched to the Indus valley. It advanced from there to south-east Asia, to the extent that coriander now seems a typical Indian spice and a typical south-east Asian herb. By way of Persia, coriander was also introduced to China. Later Chinese tradition suggested that this happened at the moment when Zhang Qian opened up the silk road, in fact that he personally brought coriander back with him in 125 BC. This is unlikely, not only historically--he had other things on his mind than coriander during his year-long imprisonment among the Huns and his lucky escape--but also because the earliest mention of coriander in Chinese texts is dated to the sixth century AD. In due course the Spaniards planted coriander in their American colonies: cilantro, as it is better known in America, is now one of the typical flavours of Mexican cuisine. It is an extremely versatile aromatic. Its leaves, garnishing meat dishes and stews, give an unmistakable pungent aroma--'soapy', perhaps, to those who cannot get the taste for it. Its spicy roots are specially useful in Thai cooking. Its tiny black fruits (often called 'seeds') are the most powerful part, described as 'cooling' by traditional pharmacologists in spite of their spicy heat. Spices and aromatics—the powerful, pleasurable, sensual ingredients used in foods, drinks, scented oils, perfumes, cosmetics, and drugs—have long been some of the most sought-after substances in the course of human history. In various forms, spices have served as appetizers, digestives, antiseptics, therapeutics, tonics, and aphrodisiacs. 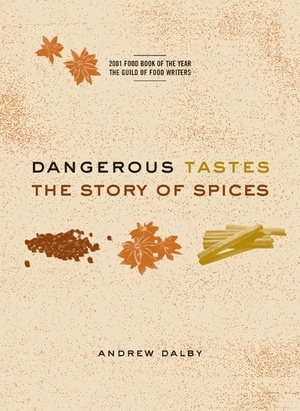 Dangerous Tastes explores the captivating history of spices and aromatics: the fascination that they have aroused in us, and the roads and seaways by which trade in spices has gradually grown. Andrew Dalby, who has gathered information from sources in many languages, explores each spice, interweaving its general history with the story of its discovery and various uses. Dalby concentrates on traditional spices that are still part of world trade: cinnamon, cloves, ginger, pepper, saffron, and chili. He also discusses aromatics that are now little used in food but still belong to the spice trade and to traditional medicine: frankincense, myrrh, aloes-wood, balsam of Mecca. In addition, Dalby considers spices that were once important but that now are almost forgotten: long pepper, cubebs, grains of Paradise. Dangerous Tastes relates how the Aztecs, who enjoyed drinking hot chocolate flavored with chili and vanilla, sometimes added annatto (a red dye) to the drink. This not only contributed to the flavor but colored the drinker's mouth red, a reminder that drinking cacao was, in Aztec thought, parallel with drinking blood. In the section on ambergris, Dalby tells how different cultures explained the origin of this substance: Arabs and Persians variously thought of it as solidified sea spray, a resin that sprung from the depths of the sea, or a fungus that grows on the sea bed as truffles grow on the roots of trees. Some Chinese believed it was the spittle of sleeping dragons. Dalby has assembled a wealth of absorbing information into a fertile human history that spreads outward with the expansion of human knowledge of spices worldwide. Andrew Dalby is a historian and linguist and has written for numerous food history and classics journals. Among his books are Empire of Pleasures: Luxury and Indulgence in the Roman World (2000), The Classical Cookbook (with Sally Grainger, 1996), and Siren Feasts: A History of Food and Gastronomy in Greece (1996).